When I began writing in the Brotherhood Protectors World last year, I wanted to create characters and stories that would cross over into my cozy mystery series and yet still be romantic suspense. So I came up with the concept of creating a case of younger characters who are related in some way, fashion or form to the older characters in my cozy mystery series. I thought this would be a good way to create great romantic suspense stories that might bring readers over to my mystery series out of curiosity to find out more about the town of Mercy, Mississippi — and the quirky characters who live there. My first book in the Brotherhood Protectors World, Persuading Piper, features Ian “Hawkeye” Elliott, who is the son of the real estate agent in the Lily Gayle Lambert Mystery series. He’s come back to Mercy, Mississippi to conduct undercover protection for the town mayor. Trouble is, Piper, the daughter of the mayor, is his high school sweetheart and the one woman he could never forget. My second book in the Brotherhood Protectors World, Handling Harley Ann, just came out. In this book, Harley Ann is the great-niece of Miss Edna — the eighty-year-old town busybody in the Lily Gayle Lambert mystery series. In this book, Harley Ann’s criminal past comes back to haunt her. And, Jesse “Bird Dog” Miller just happens to be in town visiting his buddy Ian. Jesse won’t stand for any craziness going on around the lady he’s just discovered he might be falling for. It’s been great fun to write a romantic suspense series that crosses over into my mystery series and yet appeals to a broad audience. I plan to continue to weave the two series together in the future and give readers a birds-eye view into multiple generations in a small town. 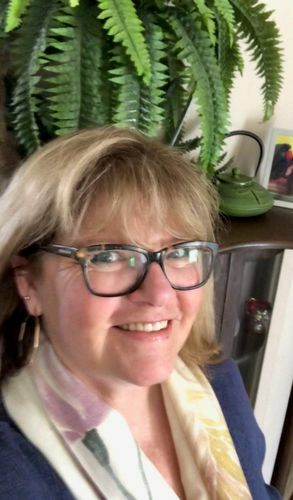 Susan Boles is the USA Today and Wall Street Journal Bestselling author of the Lily Gayle Lambert Mystery series and a contributing author to Elle James’ Brotherhood Protectors World. A lifelong love of all things mysterious led Susan to write mystery and suspense stories. Nancy Drew and Trixie Belden were the first to show her that girls can be crime solvers, Agatha Christie showed her that even small towns have big secrets, and Phryne Fisher showed the that lady detectives can be outrageously individual. Combining romance with the mystery is just the cherry on top of the writing cake! She lives in Mississippi with her rescue mini dachshund, Lucy and her rescue cat of no particular breed, Zimba. Stay in touch for further releases! 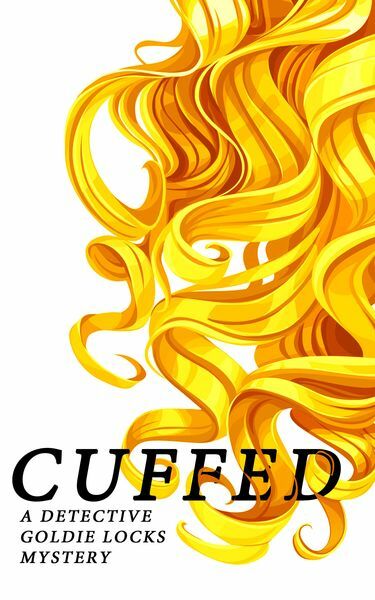 When I started writing CUFFED: A Detective Goldie Locks Mystery I had a picture in mind for an adult version of Goldie Locks, based on the fairytale character, with long flowing blonde locks and an impulsiveness that gets her in constant trouble. But finding just the right hero proved harder. Would her perfect happily ever after be with Beau White or Jack B. Nimble? Beau White checks all the boy-next-door boxes. While being the fairest man in all the land, he loves Goldie beyond compare, and even had earned the respect of the Bears, her adoptive parents. Though her history with the tarnished Jack B. Nimble, as well as his bad boy looks, made him a dark horse. Whereas he professes his desire for her, can Goldie trust a man who spent the last fifteen years of his life running cons across all five kingdoms? After all, he’s had one too many faked spills down hills for Goldie’s peace of mind. Which romantic hero appeals to you most? The Boy-Next-Door or the Bad Boy? J.A. Kazimer lives in Denver, CO. When she isn’t looking for a place to hide the bodies, she devotes her time to playing with a pup named Killer. Other hobbies include murdering houseplants. 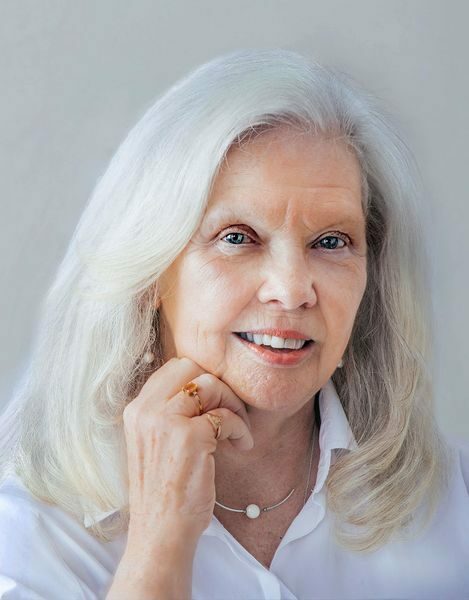 She spent a few years stalking people while working as a private investigator before transitioning to the moniker of WRITER and penning over 15 titles. Visit her website at jakazimer.com and sign up for her THIS LITTLE PIGGY WENT TO MURDER Newsletter. Beverley Bateman: How do you build your characters? How do you build your characters? Most people develop character charts. Others use tarot cards or enneagrams. I decided to go back to astrology signs for my WIP to cause more conflict. What I’ve done for many of my books I do a chart; Heroine – her characteristics. Then I draw a line down the middle of the page and on the other side of the page I do my Hero’s characteristics and I try to make them conflict with the heroine’s characteristics. As I write the story, I solve one conflict at a time. For example: Carly is a strong, intelligent woman, who runs a large company. On the other side, Link Stone is a strong man who doesn’t like strong women or being told what to do by a woman. That’s one conflict they have to work out in The Fourth Victim. Sara’s emotionally abusive husband dies unexpectedly. She’s struggling to reclaim the intelligent, independent person she was before she married. She vows never to let a man take over her life again. 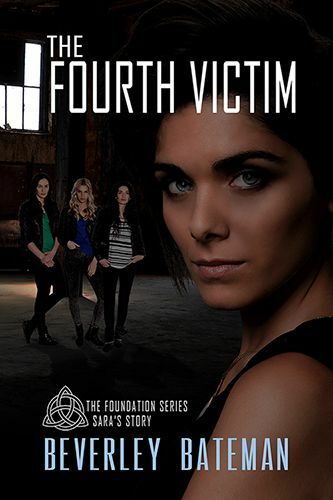 Now she’s part of a special team, training to help other women and on the track of a serial killer. Mac is been responsible for training women in special ops techniques, so they are prepared when they are challenged to save other women. When he meets Sara, sparks fly between them. He wants her to quit the training and let him take care of her. Can Mac step back and trust her in a dangerous situation? Can Sara and Mac resolve their issues, or will they go in opposite directions? Murder, mystery and romance fills award-winning, Canadian author and blogger, Beverley Bateman’s life. She loves to plot, kill and hopefully baffle the reader. Her nursing and public health nursing background helps with some details and administering a community care facility program had her investigating and directing investigations into irregularities and sometimes a death. She even has court experience. Thanks for hosting me, Delilah. I love to talk about the inspiration for my new mystery romance, Flotsam and Jetsam: the Amelia Island Affair. 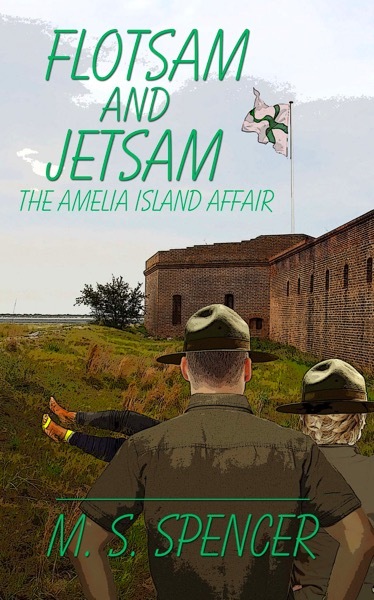 Flotsam & Jetsam: the Amelia Island Affair is a cozy mystery romance set on a barrier island in north-east Florida. Released December 17, 2018 by Wild Rose Press, it arose out of a visit to the island. I first visited Amelia Island to attend the Amelia Island Book Festival, and was struck by the crazy quilt of events it had witnessed. Known as the Isle of Eight Flags, it had seen wave after wave of conquering armies, some big—like the Spanish, and some tiny—like the Patriots of Amelia Island, who mustered nine gunboats and maybe a hundred men. Timucuan Indians, French, Spanish, pirates, Scots mercenaries, Confederate and Union soldiers—all occupied the tiny island at one point or another. It also has a sizable Geechee (Gullah) community. Faced with a setting like that, who wouldn’t want to craft a nice little murder mystery? 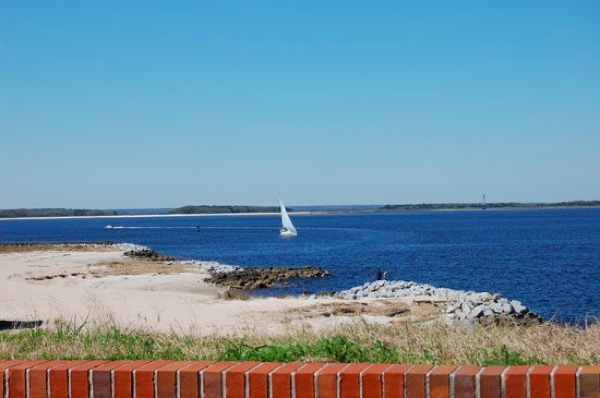 The main town, Fernandina Beach, contains several historical buildings, a marina, and Fort Clinch. Built in 1847 by the US, the fort sits on the northern corner of the island, protecting the entrance to the Amelia River. South of it is Egan’s Creek, a marshy area. 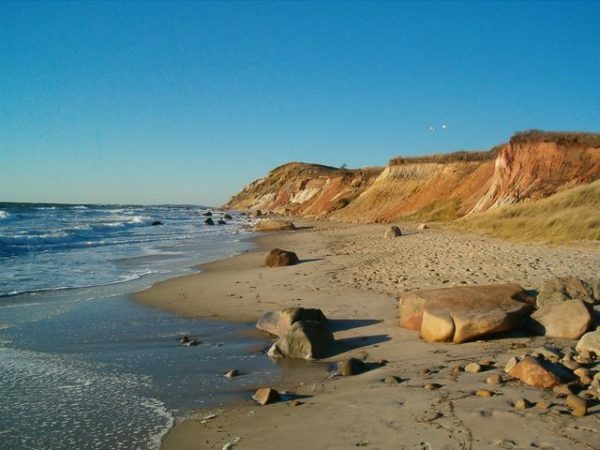 In Flotsam & Jetsam, four bodies are discovered, ranging from north of the fort all the way to Egan’s Marsh. While Ellie and Simon investigate the deaths, they have to draw on much of Amelia Island’s colorful history. I hope readers find it as fascinating as I do. The magic word. He walked the finger up her arm, circled her neck, and brought her lips to his. The kiss lingered, but not enough to satisfy him. He had adored this little creature for so long—since she arrived at the fort in fact, in a crisp new uniform, her campaign hat still unfaded, her expression a mix of terror and determination. He had fallen like a shooting star and could still feel the burn marks. But he had never in his wildest dreams thought she might feel the same way. He sat back, letting his hand fall. When they rolled up in front of Ellie’s house, a cheery yellow bungalow on Fletcher Avenue with a wide porch and hanging geraniums, a silver sports car sat at the curb. Oh great, the mighty Thad. Simon’s nemesis disentangled himself from the wheel. Slowly, as if for maximum effect, he unfurled his powerful body, planting his size fourteen shoes solidly on the ground. A beefy hand languidly brushed the sandy hair from his forehead. Strapping shoulders squared, he loped over. 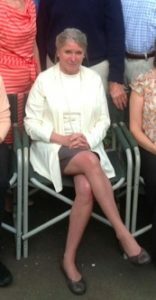 Although M. S. Spencer has lived or traveled in five of the seven continents,the last thirty years were spent mostly in Washington, D.C. as a librarian, Congressional staff assistant, speechwriter, editor, birdwatcher, policy wonk, non-profit director, and parent. After many years in academia, she worked for the U.S. Senate, the U.S. Department of the Interior, in several library systems, both public and academic, and at the Torpedo Factory Art Center. She has two grown children and a perfect granddaughter. Ms. Spencer has published twelve mystery/romantic suspense novels, and currently divides her time between Florida and Maine. A big shout out of thanks to Delilah for having me on her blog. This time of year, I’m all about Halloween… and of course murder…and well doughnuts…and vodka. My newest book is a novella about all those things! Good morning, Delilah, and thanks for having me over on this hot August day. It’s really cool and lovely to spend some time with you and your readers. When I was growing up, I didn’t like August very much. Hot and sultry as it always is here in New York, it meant that summer was winding down and it would soon be time to pack away the swimsuit, shelve those books I loved reading beneath a tree, and get back to the business of school and homework. Even when school was long behind me, the August gloomies lingered. Then I decided it was time to grow up and shed those gloomies for good. My mother had always said that there was no such thing as a bad day, week, or month. All of them were presents, and it was up to us to make something good of them. So I decided to find out something good about August. How does an author do that? Research, of course! So, welcome to Admit You’re Happy Month! Isn’t it great to have a month that urges us to sit back, take stock, and think about all the things we have in our lives to make us happy? August is also Family Fun Month, and, certainly, my family is highest on the list of blessings that brighten my days. Thank you, August, for reminding me of that. August also won’t let us forget to keep admitting we’re happy. Every week is upbeat. Last week was National Simplify Your Life Week. That’s pretty difficult for me to do, with a family to take care of and a new book just out. I may have to save it for next year. This week, though, is National Smile Week. It’s good to remember when life gets a little overwhelming that we still have much to smile about, and so many people in our lives, and even strangers, who deserve our smiles. Next week is Friendship Week—a good time to remember how much our friends mean to us and how they have always been at our side through both good and difficult times. The last week of the month is Be Kind to Humankind Week. If we all celebrated that one, our world would certainly be a better, more peaceful place. August is packed with important days in history. Some of them sad, but others are events that made our world a better place: On August 1, 1774, Joseph Priestly discovered oxygen. On August 3, 1492, Columbus set sail from Spain. The sixth of August marks the birth of Alexander Flemming, who discovered penicillin. August 14, 1945, is the day World War II ended. On August 22 in 565, the Loch Ness monster was spotted for the first time. Old Nessy is said to still keep making appearances, though not only in August. One of my favorite dates is August 18, 1920, when the Nineteenth Amendment of our Constitution, giving women the right to vote, was ratified. Lucy Stone, who fought so hard to win that right for us was born on August 13, 1818. August also saw the birth of many famous people. Here are just a few: Herman Melville, P.D. James, Louis Armstrong, Lucille Ball, Neil Armstrong, John Dryden, Cecil B. DeMille, Davy Crockett, Mae West, Alfred Hitchcock, Coco Chanel, Orville Wright, Mother Teresa, Claude Debussy, Dorothy Parker, Michael Jackson, Charlie Parker, and Mary Shelley. So, happy August, everyone—and happy August 8, which is International Cat Day, as well as Happiness Happens Day. 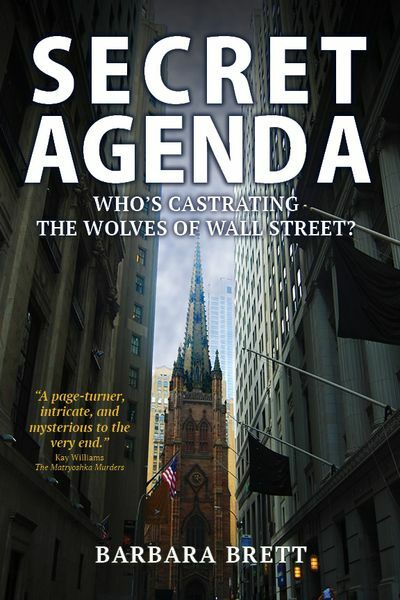 I’m now such an admirer of the month that it opens my new mystery, SECRET AGENDA: Who’s Castrating the Wolves of Wall Street? The villain’s first strike is on a moonless night in August…. the Wolves of Wall Street? They are the most powerful men in America: billionaires born to privilege and linked by their membership in the nation’s most elite fraternity. They have always snatched what they want. From the halls of their ivy-league college to the counting houses of Wall Street, nothing has ever stopped them from reaching their nefarious goals. But as they gear up for their biggest takeover of all—the presidency of the United States—they discover to their horror that someone else has a secret agenda too. One by one, they are being castrated by an unknown attacker…. SECRET AGENDA—a riveting mystery of political ambition set in the glittering heights of New York society and darkest depths of Wall Street depravity! Until she left to pursue her own writing, Barbara Brett was both a magazine editor and book editor and publisher. Besides Secret Agenda, she is the author of Sizzle, Between Two Eternities, Love After Hours, and, with her husband, Hy Brett, the critically acclaimed mystery, Promises to Keep. You can find out more about Barbara and her books on her website: www.brettbooks.com. And you can keep up with her news and her views on writing, reading, and life by following her on her Facebook page: https://www.facebook.com/BarbaraBrettAuthor. Like a lot of us, I find I have more leisure time in the summer. Work slows down, days get longer and energy goes up. Maybe it’s all a mirage, but suddenly there’s more time for the fun stuff in life. Summer Theater. Maybe I’m a geek, but I love seeing those small productions done in all the vacation spots well off Broadway—mostly in the mountains. Revivals of long ago favorites like South Pacific or My Fair Lady, or my very favorite The Pajama Game. I’m heading up to the mountains in New Hampshire to see whatever they’re showing! Shopping. I know, I know. This is a great leisure activity any time of year (think Christmas) but it’s extra special when you can cruise the boutiques and shops in a vacation town, especially one that’s on the water, and duck in for specials and AC when the sun gets too hot. My favorite spot is in the Berkshires of Massachusetts, closely followed by Wolfeboro, NH on the shores of Lake Winnepesauki. Or any water front harbor town along the coast of Maine, like York or Kennebunkport. Reading a Beach Book. This is the ultimate leisurely activity in the summer. Laying around with nothing to do but read for hours on end. On the beach or in a hammock or poolside. Or maybe in bed late at night or before you get up in the morning because you have nowhere else to be. The definition of leisure activity. If you’re looking for a great Beach Read, check out my romantic detective series, Beachcomber Investigations. USA TodayBestselling Author Stephanie Queen is a romantic at heart and a writer by nature. So of course, she loves creating stories where the good guys always win. She writes the romantic detective series, Beachcomber Investigationsset on Martha’s Vineyard and the Small Towncontemporary romance series as well as other series and stand-alone novels. So far she’s published more than 25 novels and novellas and has no plans to stop. You can check out all her books at www.StephanieQueen.com. Although she’s lost count of all the jobs she had before she settled on being a novelist, her favorite was selling cookies as a Keebler Elf. She is a graduate of UConn (go Huskies!) and Harvard U. She lives in New Hampshire with her family and her cat, Kitty.